Implementation of Variational Auto-Decoder (A. Zadeh, Y.C. Lim, P. Liang, L.-P. Morency, 2019.). Code is implemented and made easy to run by Yao Chong Lim. 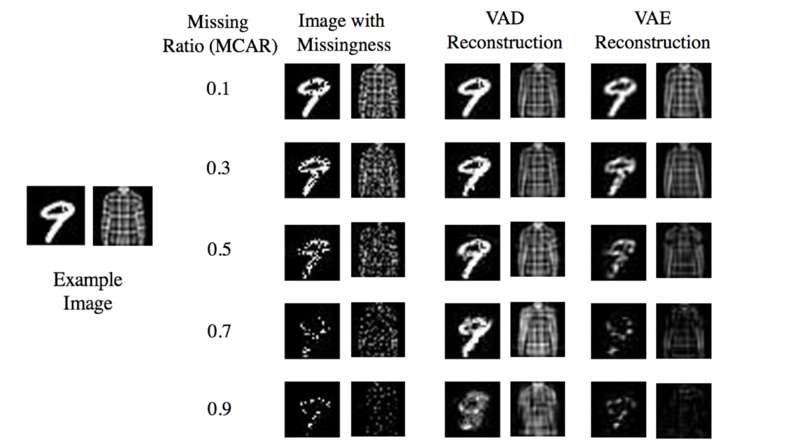 Our paper shows that encoderless implementation of the AEVB algorithm (named in our paper as Variational Auto-Decoder - VAD) shows very promising performance in generative modeling from data with missingness (low and high missingness). We claim that even through rigorous training and hyperparameter search, missingness causes instabilities in the encoder which in turn harms the reconstruction or imputations performance of the decoder. We show that for a probabilistic decoder with only one mode, the approximate posterior disitrbution can be infered efficiently using only gradient ascend (or descned) without the need for MCMC sampling from the decoder input. This makes the process of inference faster and only a matter of gradient ascent (or descent) during test-time. --> First - The input to a probabilistic decoder is sampled using Markov Chain Monte Carlo approaches (MCMC). This is essentially similar to a probabilistic inversion of a decoder for each datapoint . --> Second - An arbitrary distribution - which is easy to sample from - is fitted to the sampled decoder inputs using Expectation-Maximization (EM). --> Third - The fitted distribution is used to sample the similar data points to . --> First - An arbitrary distribution (which is easy to sample from) is sampled . This distribution is assumed to have one mode, hence gradient ascend (or descend) leads to a single outcome regardless of starting location (convergence to the unique peak of the distribution). One such distribution is a multivariate normal distribution . Other distributions with one mode exist and can be used as well. --> Second - After the sample(s, one or more samples) is drawn, the sample is used as input to the decoder . --> Third - Training is done by gradient ascend (or descend) w.r.t , inference (testing) is done by gradient ascend (or descend) w.r.t . The above method finds a mixture model based on . Sampling from this mixture model should essentially generate the learned density of . This mixture model may or may not have desirable generative properties such as meaningful manifold walk, given a limited dataset . The VAE reparameterization trick can be used to enforce certain properties using another distribution - one example is unit multivariate gaussian. We make comparisons between VAE and VAD (both example implementations of AEVB algorithm) in generative modeling from partial data (data with missigness). In the figures below, indicates the missing ratio which changes between 0.1 to 0.9 (10% to 90%). In all the figures lower is better. Please refer to the paper for exact details of each figure. The following demonstrates a comparison between VAD and VAE for the adversarial case where missingness ratio is different between train and test. Models are trained on the data with no missingness (data similar to Example Image) and tested on data with missingness (the missingness pattern is Missing Completely at Random - MCAR). This experiment can also be seen as inpainting from MCAR missingness. The losses for the reconstruction and the loss for KL (reparameterization) may act in opposite directions; simiar to VAE, enforcing nice distributional properties may come at the cost of reconstruction inaccuracy for certain data points. The code allows you to balance between the reconstruction and the KL terms. As a general rule of thumb, more complex datasets may not conform to simple , such as densities with one mode. Therefore, the reconstruction may be bad. Therefore, we also allow for dropping the reparameterization fully, thus the model only learns a mixture based on . Due to missingness in data, learning the may also be problematic hence it can be treated as a hyperparameter. The rest of this readme contains details of how to run the code and the requirements for it. For convenient grid search over hyperparameters, use the script at configs/make_configs.py to generate a folder of JSON files representing different hyperparameter configurations. Optional arguments can be found using python pytorch/train_model.py --help. To test a trained model on partial data, use the test_missing option. --missing_mode must be selected, with either the fixed or random option. To test a trained model on clean data, use the test_clean option. The above models are applied to data imputation. Since imputation is related to recreating the exact missing value, very small variances work better than larger ones.